YoungStar Applications due in Three Weeks! If you are a child care program that currently receives reimbursements through the Wisconsin Shares program, you must apply to participate in YoungStar BY JUNE 1ST, 2011 in order to continue to receive these reimbursements without interruption. Your regional office must receive the application by this date, so don’t forget to leave time for mail processing if you choose to mail your application in. DCF has just revised their YoungStar website with simple, easy to follow instructions on applying for YoungStar. Find the four step application process here! What can I do after I apply? If you are just learning about YoungStar, and want to know more, attend a YoungStar orientation session to find out details on ratings, support for programs, and micro-grants. Find training in your area! In order to earn 3 or more stars in YoungStar, your program must meet certain education levels (what education levels do I need for each level?). This education is ONLY verified through The Registry- so if your program isn’t on The Registry, we won’t be able to check this information. * Actions for Group Child Care: Ensure that all Lead Teachers and the Center Director qualifications are current and accurately reflected by The Registry Career Level assigned. See instructions for individuals to do this below. * Actions for Family Child Care: Ensure that the primary caregiver qualifications are current and accurately reflected by The Registry Career Level assigned. If the owner is not the primary caregiver/teacher, then the qualifications of the primary caregiver/teacher are evaluated for purposes of YoungStar. See instructions for individuals to do this below. * Actions for Administrators/Owners of Group and Family Child Care Programs: Create or update a Registry Program Profile within The Registry. Learn how to do this with instructions below. * Instructions for individuals to get started in The Registry and receive a Registry Career Level. * Instructions for creating a Registry program profile. In order to earn 3 or more stars in YoungStar, your program must complete a self-assessment. * Your program can complete this assessment before a YoungStar staff member comes out to your program. This will give you the opportunity to point out what’s going well in your program already and what could be going better. * Your program can also choose to complete a self-assessment with assistance from a YoungStar technical assistant. * If you would like to complete or begin a self-assessment, we recommend you choose this tool for group programs and this tool for family programs. In order to earn 3 or more stars in YoungStar, your program must complete a quality improvement plan, based on your self-assessment. * Your program can complete this quality improvement plan before a YoungStar staff member comes out to your program. This will give you the opportunity to create your own plan for improving quality in your program. * Your program can also choose to complete a quality improvement plan with a YoungStar technical assistant. * If you would like to complete or begin a quality improvement plan without assistance from YoungStar staff, download an example to use. 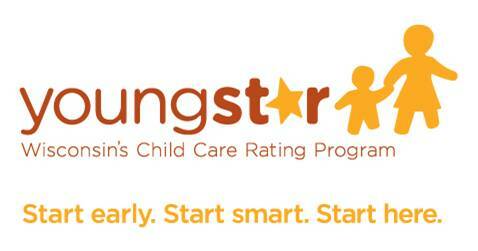 Learn about what YoungStar staff will be using when they rate your program. * Information for Group child care programs. * Information for Family child care programs. This entry was posted in Uncategorized and tagged apply for YoungStar, Department of Children and Families, Early Childhood Education, ECE Professionals, QRIS, quality rating and improvment system, Wisconsin Shares, YoungStar. Bookmark the permalink. ← Happy Provider Appreciation Day!